The 1650 is shown pushing two Bi-Polars into the service tracks at the Othello roundhouse. The Bi-Polars were long-time passenger train power between Tacoma and Othello. They were noted for their pulling power and ability to run very quietly. The photographer notes in this June 5, 1948 view that the 1650 is having engine trouble, not otherwise described. 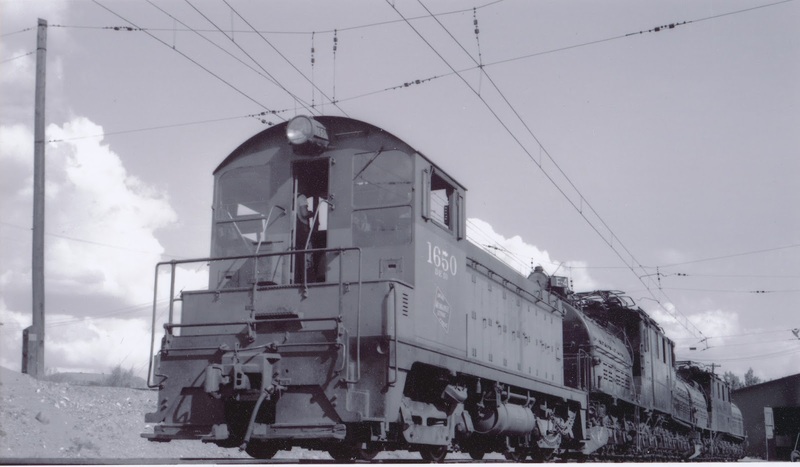 The 1650 was an EMD NW-2 1000 hp diesel switcher. They started out life in a basic black scheme but were painted into this orange and grey, with maroon stripe after a couple of years.